Hi everyone! On this website, I will be talking about one of my favorite things–playing cards. 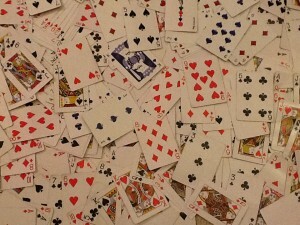 And if you do not have a specific fondness for cards, I will make a deck of cards one of the things that you love most! To tell you guys the truth, I never thought that I would develop such a love for cards. The day that I saw just how spectacular a deck of playing cards could be, was a day that I will never forget . . .
About a year ago, I went to Las Vegas, Nevada with my family. We went to an exceptional magic shop. It was truly unbelievable. The nice man at the counter showed my family and me a bunch of cool card tricks, which I was completely amazed by. And he had been using just an ordinary deck of cards! From that day on, even up until now, I try to think of cool card tricks that will hopefully blow peoples’ minds. It is truly amazing how with just a simple deck of cards you can do so much. There are hundreds, if not thousands, of card tricks out there, and many of them are really awesome. After reading the first four paragraphs of this post, I am in no doubt that you want to learn some magic tricks, and that too for free. Do not worry, my friends. You have come to the exact right website for you, where I promise to show and reveal the secrets of an immense amount of cool card tricks which will be truly mind-boggling. I am sure that right after you see the tutorial you will be able to fool your siblings, parents, friends, etc. with these amazing card tricks. Personally, my favorite type of card tricks are those which require absolutely ZERO setup. And trust me, I will demonstrate a numerous amount of those tricks, and reveal the secrets of how to do them. I will also show a titanic number of setup tricks, which are also obviously really amazing. I will not show many gimmick card tricks because I know that most people do not like those type of card tricks very much. I can understand this, because I have to genuinely admit that I do not very much have a fondness for gimmick card tricks because they do waste some cards or sometimes even a full deck. I am also going to perform most of the requests that you guys give me about which magic tricks to do and reveal. I will try my best to get through all of the requests of course. You guys can email me at ishaan@coolcardtricks.net. All in all, you will be learning how to do quite a lot of tricks on this website! OTHER Things That I Will Teach You! 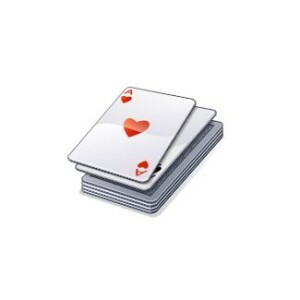 In addition, I will teach you folks some basic essentials of playing cards, such as knowing how to shuffle the deck. I will definitely teach you the riffle shuffle (my absolute favorite shuffle), as well as of course the regular shuffle, ordinary cuts in the deck, and some false cuts. These real and fake shuffles and cuts are extremely important for cool card tricks. I will also teach you some other fun things that you can do with a deck of cards. For example, I will teach you how to mark a deck of cards. Then you can go out and fool pretty much any person in the world saying that you can read their mind. Marking decks can lead to several other cool card tricks. I can guarantee that you will have a great time with my website. You will get to see me perform awesome card tricks and reveal them, get taught how to jumble up and fake shuffle a deck, and will also be taught how to mark a deck of cards. And guys, this is not all. I will be showing you many other things that you can do with cards. Just remember to stick around, and at least every couple of days come back to this website, so you can see my new posts. I am certain that you will love every single one of them. Thanks for your time! By the way, if you want to rank YOUR site, you have got to check out this AWESOME website–LinkWorth!